Yet another sketch from the Book of Job comic I’m working on. Even after being afflicted with horrible, disgusting, festering boils, Job refuses to curse God. He tears his robe, shaves his head and goes to sit in the ash-heap—taking a piece of broken pottery to scrape himself with. Here’s one of the most surprising things about The Book of Job—the Lord and Satan appear together as if on the stage of a morality play. To top that, Satan makes a bet with the Lord—that deprived of his wealth, Job would curse God. 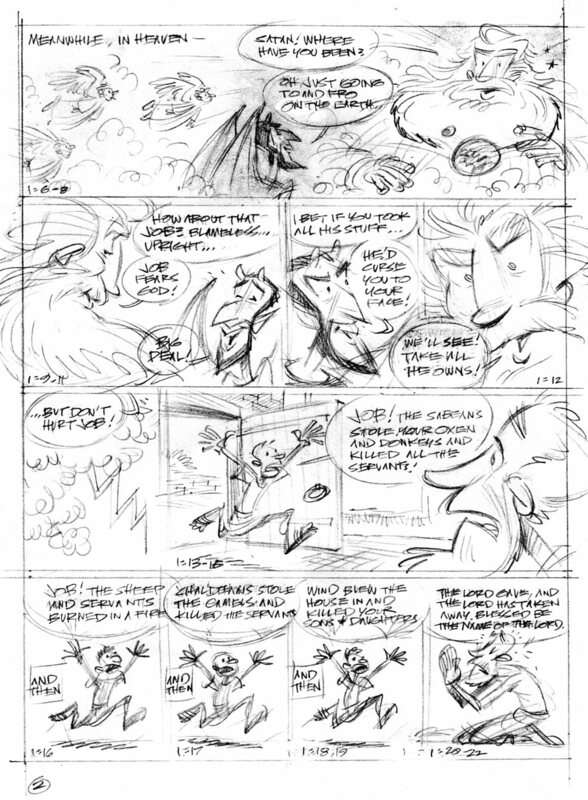 I’m trying to keep the dialogue here somewhat casual & conversational—after all, one point of this comic is to make Job’s story easier to read. I have God say: “How about that Job?…” The good old King James Version goes: “And the Lord said unto Satan, ‘Hast thou considered my servant Job, that there is none like him in the earth, a perfect and an upright man, one that feareth God, and escheweth evil? '” How I love that! Satan’s lines in the KJV are delightfully impertinent: “Then Satan answered the Lord, and said, ‘From going to and fro in the earth, and from walking up and down in it. '” (“Where’ve you been?” “Oh, out.”) This scene has echoes of ancient Near Eastern storytelling, where the gods and demi-gods have their squabbles. Gilgamesh and the gods and goddesses seemed always to have some tiff going on. Likewise in stories from Greek mythology. As with the previous post, this is a sketch which will get inked in. Yep, I’ve been working on some more of that Bible stuff I’m into. 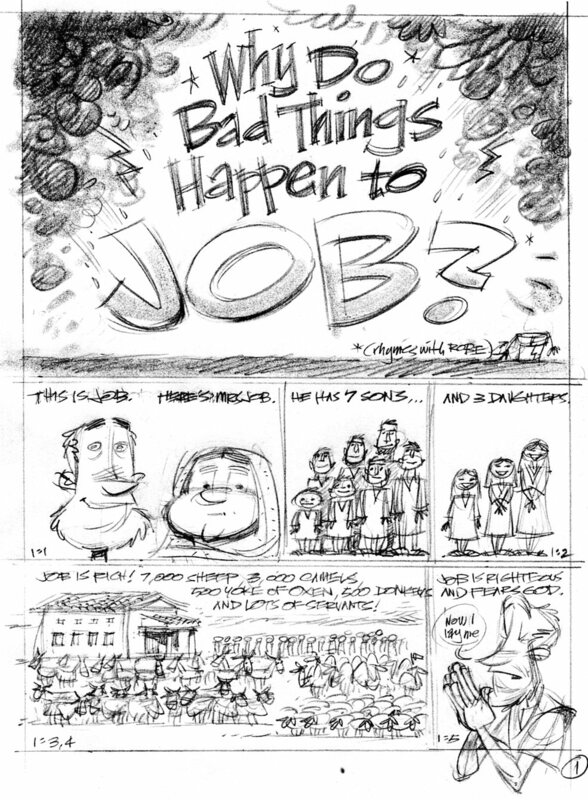 I was going to reduce the Book of Job (rhymes with ‘robe’) to a single page, as I’d done with the Major Prophets series. I didn’t feel a single page would do Job’s story justice. There’s simply too much story in Job. So here’s the opener for an 8-page comic. This is merely the sketch, of course. I’ll ink it in like a proper comic. Maybe I’ll figure out how to color it, too.